At Somerset Door & Column Co., we feel strongly in providing product support. These resources include installation instructions, available options, brochures and warranty information. If you can’t find what you are looking for here, contact one of our experienced customer service specialists for all the assistance needed to design your own custom style door and column. You can trust the products made by a company that has been in business for over 100 years. 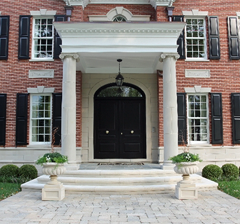 Since 1906,Somerset Door & Column Company has been one of the most reliable manufacturers of architectural wood columns and custom doors in the United States. While the company is built around tradition and authenticity, the manufacturing procedures used today are modern and second to none. Trained craftsmen combined with state-of-the-art manufacturing machinery like CNC routers and computer controlled profilers create the most accurately constructed doors and columns possible; long-lasting products that will stand the test of time. Some manufacturers outsource components in their production process. At Somerset Door & Column, all wood components are fabricated on-site to control quality and overall aesthetic appearance. Put your trust in a company that has been satisfying architects, construction companies and homeowners for over 100 years - Somerset Door & Column.